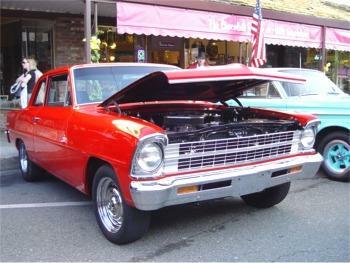 Tonight, July 8th, is the 3rd Cruise Night for the year. Just a reminder that the streets will be closed from 4PM-9PM starting at the clock tower on Lincoln Way and going all the way up towards Lincoln Way & Harrison Avenue. We will still be open this evening, and would like to remind our guests to give yourself a little more time while joining us to look for parking. There is parking behind us on Cherry Ave, as well as across the street on High Street, by the bank. Please remember if you choose to dine outside tonight, that it will be much nosier than normal due to the revving of engines and the large crowd that comes out to see the classic cars. Smoking is not permitted on the patio and you may not bring outside drinks or food onto the premises. Also, all alcoholic beverages purchased in the restaurant must be consumed in the restaurant. This is a fun family event during summer months, and we are looking forward to bringing you handcrafted cocktails and a delicious dinner this warm summer evening. We are open from 5:00-9:00 tonight. To make dinner reservations, please click this link, you will be redirected to our home page. There you can click the “make reservations” button and easily make reservations via OpenTable. Thank you & Happy Friday Auburn! No Replies to "Cruise Night, July 8th"